In a recent tweet from Alexandria Ocasio-Cortez, she claims that this letter which recommends a fundraising effort of $10,000 for medical care, 'comes from an insurance group'. 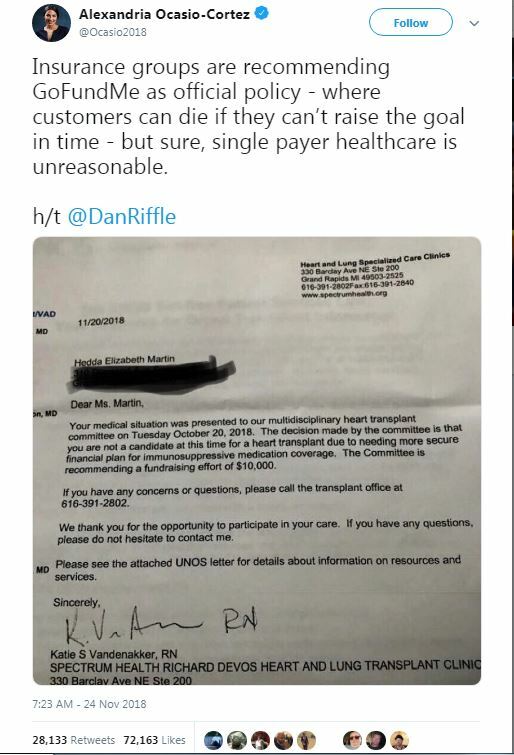 Well-known conservative Ben Shapiro claims that this letter actually "comes from a medicaid group". While they're not stating that the letter literally comes from either group, Ocasio-Cortez is suggesting that the insurance group refused to provide for the treatment, while Shapiro suggests that the medicaid refused to provide for the treatment(?). I could not find supporting evidence for either claim although, as this claim was brought to light by Ocasio-Cortez, it seem plausible that this was used as a political weapon in favour of Ocasio-Cortez healthcare goals. Your medical situation was presented to our multidisciplinary heart transplant committee on Tuesday October 20, 2018. The decision made by the committee is that you are not a candidate at this time for a heart transplant due to needing more secure financial plan for immunosuppressive medication coverage. The Committee is recommending a fundraising effort of $10,000. Is there any evidence to suggest that this letter 'comes from an insurance provider' or 'comes from a medicaid group'? 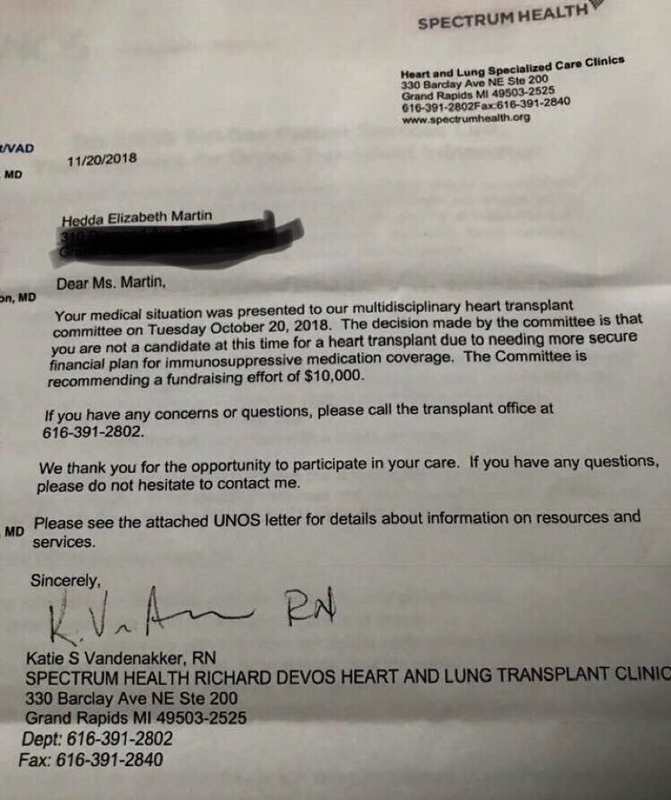 The letter is from the Heart and Lung Clinic of Spectrum Health, a healthcare provider based out of Grand Rapids Michigan. It is not from either an insurance provider or a Medicaid group. In other words Spectrum is in the business of providing healthcare (and getting paid for it). It is not deciding who gets - or does not get - money to cover their healthcare needs. More specifically the letter is from the heart transplant committee, a group of doctors who decide who is eligible for heart transplants and who is not, based on their medical judgement. They are declaring that the patient is not eligible to receive a heart transplant. So if this is a medical judgement by a healthcare provider, why are they talking about money? Because the immunosuppressive medication the letter talks about is a critical part of the treatment. It would appear that the patient has coverage for the transplant but not the associated drugs. Put simply, if the patient got the heart transplant but not the immunosuppressive drugs, that would not help them very much. The body's immune system would reject the new heart. Heart donors are rare, and to give a donated heart to a patient who could not take the immunosuppressive drugs (for whatever reason, including being unable to afford them) would be a waste of a heart that might save the life of someone else. So the committee removed the patient from the transplant list. So why the talk about a GoFundMe compaign? We don't know the reasoning, but it makes sense that this is intended to be a helpful suggestion about how the patient might raise the money if neither their insurer or Medicare will pay for the treatment. This is not a money provider refusing to pay for a treatment. It is a medical organization saying they will not provide a partial treatment (which otherwise could save the life of another patient) to someone who does not have funding for the entire treatment needed for success. Nothing in the letter indicates whether the coverage that the patient does have is from an insurer or from Medicare (or similar). Commentators have pointed out that Medicare has a drug treatment exclusion/copay that can leave patients in this situation, but we don't know if that is the case. We can only deduce (with some confidence) that their coverage provides for a heart transplant operation but not the drugs necessary to make it successful, and draw our own conclusions about the logicality of that. And yes, the end result is going to be that the patient will probably die unless they can manage to raise $10,000, and that this problem is caused by the policies of whoever provides her coverage. You can see a much deeper analysis of this situation on this Twitter conversation (for which thanks to @fredsbend), which also includes some of the author's political take. If a defibrillator is correctly applied to a person with a normal heart rate, what consequences will they suffer?